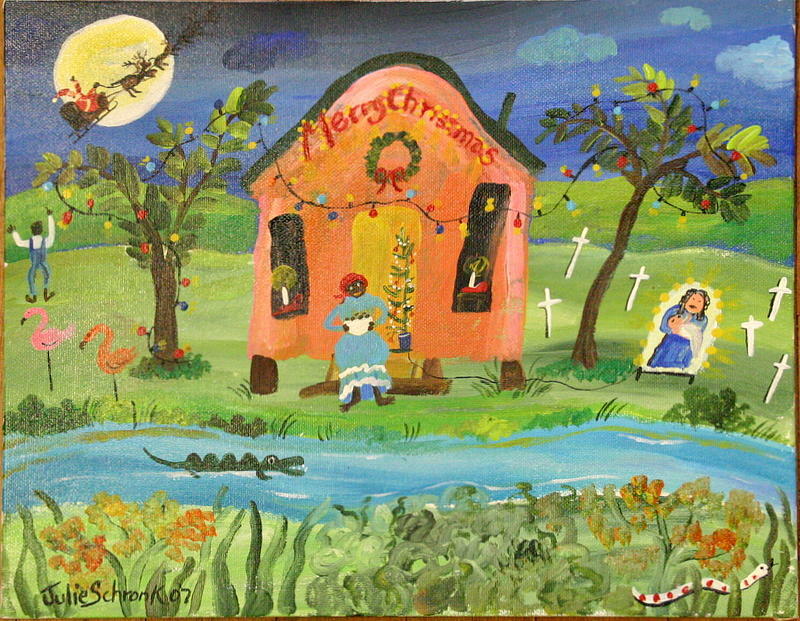 Bayou Christmas is a painting by Julie Schronk which was uploaded on January 15th, 2010. Left over from Christmas but always popular is this new 11 X 14 painting of the kind of BAYOU folk art I am so well known for. Notice the wily gator lurking about and the bayou trees. The house is all decked out and lit up and mammy is sitting out on the porch waiting for Santa. Notice the lit up Madonna with Child funky sign in the yard and the pink flamingos. Santa himself is circling with his sleigh in front of the moon! If you look close you will maybe find a snake. Yikes! There are no comments for Bayou Christmas. Click here to post the first comment.